If the moneyline has too much juice on it, and a run line bet is too complex for your taste, turn to one of the most underrated and unheralded bets in baseball: totals betting. Generally, Sportsbooks protect themselves much less on these types of baseball bets than they do on the moneyline. Most bettors are familiar with betting on the “total” in football, more commonly referred to as the over/under. You can make the same type of bet in baseball, wagering on the number of runs scored by both teams combined. 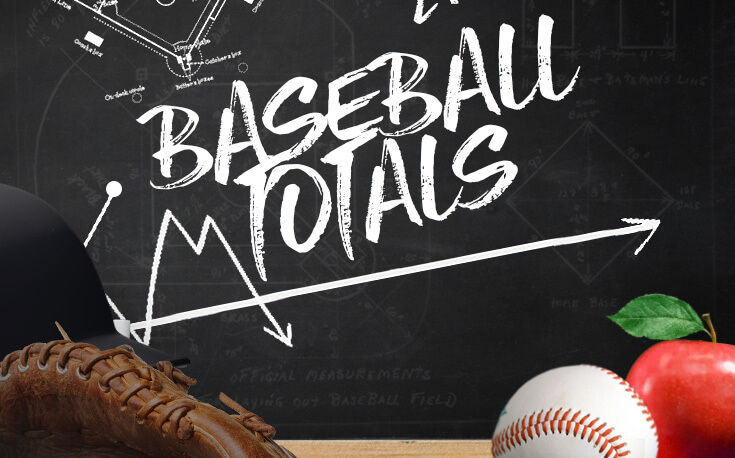 For a detailed explanation of how totals betting works in MLB baseball betting accompanied by some helpful examples, read on! The first thing we need to start betting the over/under with any kind of accuracy is to understand probabilities based on past results. The following chart shows how often certain totals occur in baseball, based on hundreds of thousands of games of data. Just as there are key numbers in numbers in football (i.e. totals that occur more frequently than others) there are also more common totals in baseball. As you can see from the chart, the odd numbers have higher frequencies because games cannot end in a tie. The juice (a.k.a. the vig) is not always -110, but it usually is. We’ll look at some of the deviations soon, once we have the basic principles down. While the final score can’t end up tied, over/under bets can end in a “push” (when the total number of runs scored in the game equals the betting total). Sportsbooks do not want games to push because they have to refund all bets in such cases, including the juice. So, by setting the total on the more common outcomes, they are taking a greater risk that there will be more pushes. Books often “shade” the run total up or down, and adjust the payouts on either side. Instead, what books will often do is “shade” the total up or down, and adjust the payouts on either side. By “shading” we mean adjusting the vig to -125 or more on the more likely outcome. (The less likely outcome is correspondingly adjusted in the other direction.) The adjusted payout still encourages action on both sides. Say, for example, the Cubs were facing the Dodgers, and both teams had their aces on the mound. The sportsbook was originally going to set the total at 7 (the most common outcome), with the over and under both at -110. Instead of doing so—and taking a greater risk of a push—the book decides to shade the total down to 6, and make the under +105 and the over -125. Some bettors will think the lower payout on the over is valuable because not many games finish with fewer than 6 runs scored. However, other bettors will think the under is worth betting on because you don’t have to risk as much to get the same return and both teams have good pitchers scheduled to start, which should keep the score low. Bettors may end up wagering the same amount of money on the aggregate, but the sportsbook has a much lower risk of a push (because only 7.2% of games end with exactly 6 runs scored, whereas 11.3% end with 7 runs scored). Below is the daily rotation showing only totals from five different sports books, labeled with columns A through E. In this table, the top number is what you would pay for betting on the over, and the bottom number is the price for betting on the under. That is generally accepted as the universal way of looking at totals regardless of what online sportsbook you utilize. The home team is always the bottom team. Side note: this helps explain why there is no total listed for the Cubs vs. Milwaukee at Wrigley Field. Wrigley is a small park, and very wind-dependant. Books will wait as long as possible to post the total because they want to know the actual wind speed and direction as close to the first pitch as possible. Remember, sportsbooks do not try to make it easy for people to win. The next game on the rotation is the Phillies and the Pirates. You will note that four of the five sportsbooks have a total of 9, while Book B is still dealing an 8.5. If you think that these teams will score more than eight runs, then you might think that 8.5 option is great! However, there’s a catch. Betting the over on the 8.5 line has a lower payout (-130) than betting the over at the books that have the total at 9. If you think the game will be lower scoring, then having the ability to bet “under” 9 runs at Book A is a safer option since if the game ends 5-4 you will push your bet. You will pay for that safety net as the vig, in that case, is -110, whereas if you wanted under 8.5, Book B has the vig at +110. That is a riskier option with a higher reward. Doing your due diligence on getting the best possible value on your lines across sportsbooks is integral, and it’s a practice that all sharp bettors engage in. If you want to learn about why it is such an essential strategy, have a look at our guide on how to shop for the best lines. Just as getting the best price is important when betting a money line, the same applies here. We have already laid out the totals and the likelihood of a game landing on certain final scores. We know that 7 and 9 are the two most common final totals. Since a game cannot end in a tie, games that are tied at 3-3 or 4-4 through nine innings will always end with (at least) one more run. That means the difference between getting 7 and getting 7.5 is truly a massive difference. The same can be said for 9 and 9.5. If we take the worse number (9.5), we will decrease our win probability significantly. It is only a half-run, but now we need the teams to combine for ten runs to win. Before, we would have at least gotten our money back if only 9 runs were scored, which again, happens over 10% of the time in baseball. The reverse is true if we want to bet under the total number of runs. Since landing on 9 is a high probability outcome, betting under at 9.5 is a much better bet than under 9 runs. How Is the MLB Total Formulated? You might wonder why there is such a difference in the O/U from game-to-game. Not all starting pitchers, bullpens, ballparks, and batting orders are created equal. Games in Oakland are generally lower scoring as well because the ballpark is large and has a tremendous amount of playable foul territory. A Dodger game with Clayton Kershaw starting is quite likely to post a 7 or lower. Games in Oakland are generally lower scoring as well because the ballpark is large and has a tremendous amount of playable foul territory (meaning more outs occur in foul ground). In Colorado, the Rockies’ home games are generally double-digit betting totals because the park is small, and the thin Mile High air allows the ball to carry better. Weather is also a factor, especially wind, which can be blowing straight out, straight in, or somewhere in between. Air temperature and humidity also impact the total, especially in a place like Texas. Not only does the heat affect the ball, but the players. When it’s 105 degrees out, most starting pitchers can not physically make it past six innings. One area where bettors can get a leg up on books is by looking at the umpire. Who is behind the plate usually isn’t taken into consideration by the books, but sophisticated bettors know that certain umpires have tendencies. For instance, some tend to have bigger strike zones, theoretically leading to easier outs and lower scoring games. Almost all of those variables are factored into the number to some extent, but they won’t all be equally important for each game. The best over/under bettors are the ones who can figure out which ones carry the most weight in a given game. Bookmakers offer the option of betting on how many runs will be scored in just the first five innings, which can be advantageous for two reasons. First, you have the ability to eliminate the bullpens from the handicapping equation. Second, you know that both teams are going to get 15 outs, whereas in a nine-inning game, the home team won’t bat in the bottom of the ninth inning if they are winning. Anytime you can turn a variable (not batting in the bottom of the ninth inning) into a constant (guaranteed 15 outs) you have increased your advantage. Another opportunity is to bet on the number of runs scored by either team, as opposed to wagering on the combined total. This is commonly referred to as the “team total.” It’s otherwise identical to betting the game total: you can bet over the posted number or under. The number the books use is simply a derivative of the total for the game, broken down by who is expected to win. However, team totals are not always perfectly correlated to the game totals, especially when the game total has moved. So there are some mistakes to be taken advantage of on occasion. Books will be quick to move the entire game total when there is one-sided action they need to balance, but they’re not as quick to adjust the team totals up and down. That’s, in part, because the team total wager attracts less action, so the books have less exposure to be concerned about. It’s more common to see books move the payout/vig rather than adjust the whole number. Team totals are not generally available to bet until later in the betting cycle, typically the day of the game. One reason is that books will take as long as they can to eliminate “mistakes,” which could mean waiting for injury reports and lineups. If a player the caliber of Miguel Cabrera is not playing for whatever reason, that will affect both the total for the entire game as well as the “team total” for the Tigers. As mentioned earlier, whenever you can eliminate a variable you will gain an edge. The players, weather, and umpires are human, hence less predictable on any given day. The stadium dimensions, however, do not change during the course of a season. Here are the top five and bottom five parks by home runs in 2016, for example. If we were to focus multiple years, the lists wouldn’t deviate much. The top and bottom five are similar from year to year. Yearly statistics are somewhat dependent on the strength of the team(s). However, there’s a reason why pitchers don’t want to sign with the Rockies and why many pitchers have had great years in Oakland, only to sign big contracts elsewhere and be humbled. Want to Learn More About Baseball Betting? Searching for more answers to pressing baseball betting questions? We’ve got your back! We answer (hopefully) every query you can conjure in our guides on how to bet on sports.